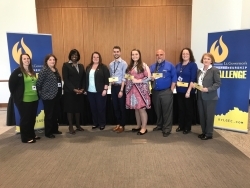 The Kentucky Innovation Network (KIN) at Eastern Kentucky University helped 15 teams of Lee County High School students prepare for the Lieutenant Governor’s Entrepreneurship Challenge pitch competition. Out of 700 teams across Kentucky, one from Lee County High School placed first in the recent competition in Pikeville. Lee County High School students Michael Ackerman, Morgan Phillips, Jacob Osborne and Matthew Riley took home the win for their business concept, Simply Tiny Inc. As pitched in the completion, the founders, in collaboration with students from Lee County Area Technology Center in Beattyville, would use construction of tiny homes to serve as the primary revenue source for the business. The Lieutenant Governor’s Entrepreneurship Challenge is a business pitch competition open to Kentucky high school students in grades 9-12 from public, private or home-school groups. Through a partnership with the KIN and Junior Achievement, the event aims to encourage entrepreneurial thinking and provide real-life multifaceted business experiences to students across the Commonwealth. The Kentucky Innovation Network at Eastern Kentucky University is a part of a unique and dynamic partnership that facilitates the development of start-ups, and assists growth-oriented businesses. It is managed as a partnership involving the Kentucky Cabinet for Economic Development, the Kentucky Science and Technology Corporation, and EKU. Last fall, Lee County Schools Superintendent Jim Evans contacted the Network about incorporating entrepreneurship in the high school curriculum. KIN Director Kristel Smith and Assistant Director Stephanie Purvis pitched the Lieutenant Governor’s Entrepreneurship Challenge opportunity to approximately 200 Lee County High School students. From there, 15 teams participated and developed their ideas through entrepreneurship coaching with the business model canvas, provided by Smith and Purvis. Each team created a comprehensive written business plan, prototype of their product or service, and prepared a PowerPoint and verbal presentation to pitch at the competition. Evans and Lee County High School Principal Debra Smith proactively rallied community leaders for support. In addition to the Kentucky Innovation Network, EKU Regional Outreach Agent Fawna Playforth, Lee County Economic Development Director Dedra Brandenburg, Lee County Youth Career Connection Coordinator Jeanette Brandenburg, former Youth Service Center Director Pam Cornelius and the local adviser, Rebecca Mullins, all played vital roles in helping the Lee County students prepare for the LGEC. For more information about the Kentucky Innovation Network, visit www.kyinnovation.eku.eduor call 859-622-8571.